April is the second most popular time of the year to do treks in Nepal. Favorable weather, beautiful, long sunrises, and sunsets along with magical views are all part of trekking in Nepal in April. Spring is in full bloom in April. You can enjoy full blossoms of rhododendrons and other wildflowers at their peak. The forests in the hills and higher regions of the mountains are lush green. All these make April one of the best months to do treks in Nepal. Even the high altitudes of Nepal have mild weather. This makes it a great month to do all the popular, high altitude treks of Nepal. In April, the weather and temperature of Nepal are most favorable for trekking. This makes it one of the best months for trekkers. You can enjoy mild and warm weather in the lower regions of the trek. Below 2000m in the hills and valleys of Nepal, you can enjoy day temperatures of 20-32 degrees Celsius. At altitudes between 2000m to 5000m, you can enjoy moderate weather. Here, the day temperatures are warm at 12 to 20+ degrees Celsius. The temperatures hardly drop to zero or negative degrees even during the nights. You can enjoy your trek in warm and dry weather. Hence, it is a good time for climbing high passes and peaks in Nepal as well. The high passes are usually snow free. You get clear and magnificent mountain views during this month. April sees very little to no rain. The average rainfall during April in Nepal is only 57mm. This generally occurs in early April. 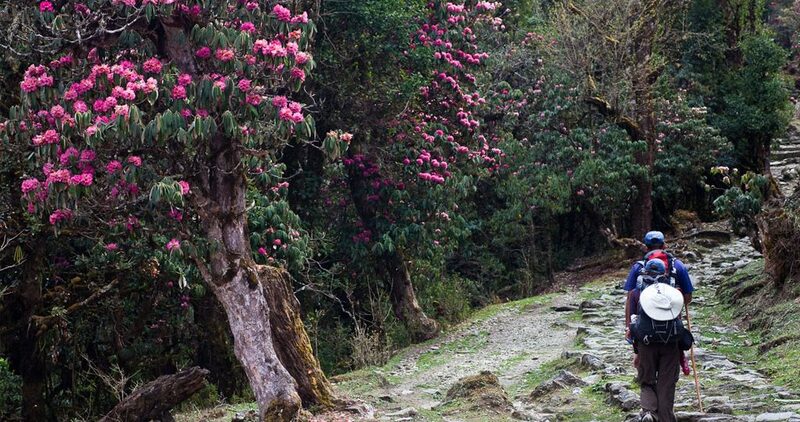 In lower regions of the trek, you can enjoy the trek in the sweet aroma of the blooms of rhododendron and wildflowers. This is especially true for treks in the Annapurna and Langtang region. Note: Trekking in Nepal includes a wide variation of altitude and temperature. So, weather conditions and temperatures can and will vary with the change in altitude. There are also differences in these depending on the trek routes you choose. Expect base camps and passes to have extreme weather conditions. Remember! The temperature goes down 1°C/1.8°F for a 100 m climb. Trekking in Nepal in April is popular and comfortable. It has favorable trail and weather conditions as well as visibility. Almost all trek offers abundant greenery and trails with colorful flowers. All treks are accessible during April in Nepal. This includes all the popular trails in the Everest and Annapurna regions. It also includes the restricted region treks of Nepal. Each trekking trail and destination of Nepal has something to offer everyone. Everest Base Camp Trek is a popular choice for people from all over the world throughout the year. Yet, April is the best month to do this trek for its weather. The daytime temperature in Everest Base Camp in April ranges between 8- 19 degree Celsius. During the nights it can drop to -15 degree Celsius. Hence, April is a festive month for mountaineers in Everest as well. Several Everest expeditions take place in April. You may get to meet world-renowned climbers on your trip to the Base Camp in April. The tents and trekkers in their gears turn Everest Base Camp into a colorful and lively field. Thus, April is one of the best time to visit Everest Base Camp Trek. As the views are fabulous in April, you can also opt for other trekking routes of the Everest region. This includes treks like Tengboche Everest View Trek, Gokyo Chola Pass Everest Base Camp Trek, and Classic Jiri to Everest Base Camp Trek. Some of the best views during your flight to and from Lukla. Breathtaking views of spectacular mountain ranges of the Everest region. You can view Mt. Pumori, Changtse, Nuptse, Lhotse, Amadablam, and Thamserku on this trek. The frozen lake of Gorak Shep at 5,164 m elevation. Hiking to Kala Patthar- You get a stunning panorama of the entire Mt. Everest from here. You can also see the mighty Khumbu Glacier and the surroundings snow-clad peaks. 15% of annual Annapurna Circuit trekkers do this trek in April. This classic trek offers one of the most diverse and stunning treks in the Himalaya. This trek encircles the Annapurna massif itself. On this trek, you get to see the diverse flora, fauna and ethnic groups of the Annapurna region. You get incredible views of some of the most stunning 8000+meter mountain peaks. This includes both the Annapurna and Dhaulagiri ranges. Kali Gandaki Gorge: The deepest gorge in the world lies on this trek. Thorong La pass at 5,416 meters: The highest and most challenging pass on the circuit. Yet, in April, you get a stunning and clear view of the Himalayas from the top of the pass. Cozy tea house accommodation and local meals. You can enjoy some of the best tea house accommodations on this trail. Be sure to try the local delicacies like the local apple pies, Gurung bread. Rhododendron forests. You can enjoy colorful blooms of rhododendrons and other wildflowers of the region. You can also enjoy the aroma of the flowers in the lower regions of the trek. Annapurna Base Camp Trek rewards you with stunning views of Mt. Annapurna. Mt. Machhapuchhre, and Mt. Dhaulagiri. In April, the magnificent Himalayas are your constant companion. This popular trail takes you through beautiful, quaint villages. This includes Gurung villages and other indigenous communities. This is one of the most accessible and easier treks of multi-day treks of Nepal. Annapurna Conservation Area: You will walk through here. In April, it is a paradise for bird watchers and nature lovers. Two base camps in one trek. You will trek through both Fishtail (Machapuchare) Base Camp and Annapurna Base Camp. Dense and vibrant rhododendron forests, beautiful meadows, and gorgeous mountains views. Spectacular sunrise and sunset views over Annapurna Mountain range. Langtang Valley Trek is a short and easy trek which takes you to the valley of glaciers- Langtang Valley. April gives you a chance to witness wildlife and flora of Langtang National Park. Some animals to look for are the monkeys, musk deer, barking deer, and the endangered Red Pandas. In April, you can enjoy the dense and vibrant rhododendron and pine forests. April offers mild temperature along with majestic views along the trek. 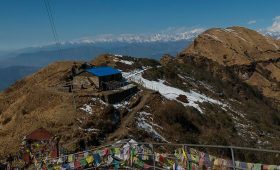 For a more cultural experience, you can try the Tamang Heritage trail or Gosaikunda Lake Trail. Yala Cheese Factory: You can learn about the process of making cheese here. Kyangjin- Ri: Spectacular views of Langtang and other Himalayan ranges from here. Kyanjin Gompa: One of the old and significant Buddhists monastery located at 3,740 meters. Amazing views of mountain peaks. This includes Langtang Lirung, Yala Peak, Gangcheenpo, Naya Kangri, and other peaks. Jaw-dropping view of the snow-capped mountain from Kyanjin Ri. Green terraced farm, rhododendron forests along the trails. This trek offers you an opportunity to explore the remote and less known part of Nepal. In April, the region sees dry weather and clear skies. You also get breathtaking views of the snow-capped mountains. 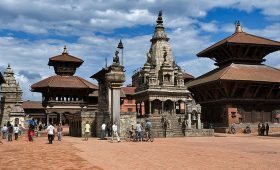 It can be an excellent alternative if you wish to avoid the crowds of the popular trails of Nepal. You can witness the rich Tibetan Buddhist culture and some of the oldest monasteries in the country on this trek. This trek provides a real sense of being in the wilderness. The spectacular Lake Phoksundo and chance to spot rare wildlife are also part of this trek. This is a difficult trek due to the altitude and the remoteness of the area. Yet, the breathtaking views in the wild, rustic environment make this trek well worth the effort required. Remote region and rarely visited part of Nepal. Several passes over 5,000 meters. Shey Phoksundo National Park- The country’s largest National Park lies here. Shey Phoksundo lake- the deepest lake in Nepal. April is an excellent time of the year to visit Upper Mustang. This once, forbidden kingdom within Nepal is a rare untouched land in the Himalayas. Lo-Manthang, the capital of Mustang is the only walled city in Nepal. The local Loba people are Tibetan descendant and have a very rich and preserved culture. You can watch them herd yaks, farm their own food and trade goods. This trek offers you a chance to leave the modern world behind. At the same time, it offers some breathtaking scenery while you walk along the trails. You can also camp beneath the stars for a better view of the sky at night. This is the most popular trekking destinations in the monsoon of Nepal. In April, the journey is no less stunning. Upper Mustang trek takes you through stunning mountain desert landscape like the Tibetan plateau. It also takes you along the beautiful villages of Jomsom, Kagbeni. You will see ancient Buddhist monastery, Cave, and museum. In April, you can enjoy your walks in warm temperatures with clear skies. You also get amazing views of Mt. Annapurna, Mt. Dhaulagiri and other mountains. Experience a vast difference in landscapes. Explore the incredible Mustang region in peace. Immerse yourself in the culture of the high mountain people. Close and stunning view of Mt. Annapurna, Mt. Dhaulagiri, Mt. Nilgiri and Mt. Manaslu. Visit old Buddhist monasteries built in the 13th century. Manaslu Circuit Trek surpasses everyone’s expectations. It is an incredible trekking destination with fabulous and unhindered views of Mt. Manaslu. In April, this trek features blossoms of rhododendron forests and 19 different species of bamboo at their peak. It also includes precarious bridges, raging rivers, and rare wildlife species. This trek takes you through the more wild, remote and less frequented trails. It offers incredible natural beauty and the untouched culture of the ethnic inhabitants. You will also get a better opportunity to overview the Tibetan culture and lifestyle. Amazing view of the Mt. Manaslu, Mt. HImchuli, Mt. Ganesh and Mt. Machapuchhre. Larkya La pass- Highest pass of Manaslu region. 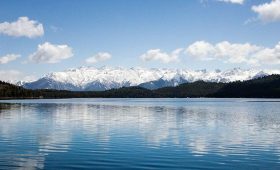 Pristine glacial lakes, snow-capped mountains and close encounters with local communities. Fewer crowds with authentic trekking experience. Amazing landscapes with varied landscapes. This includes snow-capped mountains and sub-tropical jungle. Festivals of any country reflect the culture, traditions of the locals. You can witness the rich and diverse culture of Nepal firsthand through one of its festivals. Bisket Jatra is an annual celebration of two of the most important deities of the town of Bhaktapur. These are the wrathful god Bhairab and the goddess Bhadrakali. This festival takes place during mid-April. On this day, you can witness the locals of Bhaktapur perform many street dramas. You can view the chariots during their rest stops at certain places throughout the city. Nepali New Year occurs during mid-April. People have an official holiday and enjoy with picnic, tour, travels, get-together, parties. The young generation also celebrates New Years at clubs, hotels, and restaurants. Buddha Jayanti is a day for celebrating the birth and enlightenment of ‘Buddha’. Both Hindu and Buddhist communities celebrate this day. Different religious programs like religious teaching, meditation and prayers take place. This occurs at different stupas and monasteries all over Nepal. You can observe devotees offering butter lamps, flowers, and fruits. On the occasion, you can visit Swyambhunath, Baudhanath, or many Buddhist monasteries in Nepal. April sees some of the most stable weather conditions in the Himalayas. This means less risk on the trails along with fewer chances of flight delays, roadblocks. In April, you can enjoy your trek in the long, bright days. You will not have to rush to reach your destination. You can enjoy the views and pace yourself. April offers amazing clarity. This refers to some of the best mountain views along the trekking trails. You can also enjoy views of colorful blossoms of the local flora. Entire hills are set in blossoms of rhododendron and wildflowers of the region. You can enjoy the sweet aroma of these flowers while you trek. You will find them in plenty in the lower regions of Annapurna, Langtang, and Manaslu. April sees the 2nd most number of travelers and trekkers in Nepal. Most trekking areas of Nepal do not have much problem with crowds. Yet, the popular trekking areas of Annapurna and Everest region sees a steady stream of trekkers. The good lodges fill up fast in April. The flights, tourist buses also fill up fast. So, make sure to book in advance to get your preferred rooms, flights. April is spring and has sunny days. Yet, at lower altitudes of Kathmandu and Pokhara, the days are hazy. This blocks the views of the surrounding mountains. Most of the hotels charge a peak-season rate in April. This is a bit higher than the low-season rate. April is a busy season for most trekking trails of Nepal. So, book everything ahead- your flight tickets, accommodation. Choices for rooms may get scarce in the popular trails of Everest and Annapurna. Follow the cultural etiquette while visiting temples or religious monuments. Always take off your shoes, hats. Ask before taking any pictures. Bring good footwear (hiking boots) and warm clothes no matter what it’s like when you set out. Make sure you include windproof and waterproof jackets and pants in your packing list for the trek. It is the windy month in Nepal. Always dress in layers. The treks take you through different landscape and altitude within the same day. You will sweat a lot in the lower altitude during the daytime. The days are long and bright. Bring sun protective gears- sunglasses, sun hats, sunscreen lotions. When you feel ill or uncomfortable during your trek, immediately tell your guide. Never try to fight or hide it. AMS does get worse and can lead to deaths. Bring enough cash. Most of the trek areas and trails do not have reliable ATM facilities. Nepal has diverse ethnic groups. Hence, some popular festivals are only celebrated in certain regions of Nepal. Else they take place on different dates. Different ethnic groups can and do follow different sets of the calendar. Hence, the dates of festival change on the Gregorian calendar every year. April is a perfect month for treks in Nepal. It has more stable weather conditions ideal for treks. It is a great month for climbing high passes, small and large mountain peaks in Nepal. You can also enjoy blossoms of the local flora, lush green valleys, and field. There are also interesting festivals in Nepal. With all the trekking trails and destinations open with a pleasant climate, April in Nepal is a trekker’s paradise. Hence, you can have a great trekking experience along with more adventure. If you have any further queries or questions related to treks and tours in Nepal, feel free to contact us.